Gather round, brown thumbs . . . I have good news. You can grow your own herbs at home. A former notorious killer of innocent houseplants, I’ve turned over a new leaf. Against all odds, I’ve managed to grow my own herbs for the kitchen, much of it from seed. And I think you should give it a try. Oh, and you can’t use the “I don’t have room to plant things excuse.” Herbs like containers, so if you don’t have a yard to start a garden, just pick up a few pots and some good quality potting soil and you’ll be in business. Go on, it’s really easy. I mean, you still have to remember to water them, but aside from that, totally effortless. Okay, and you have to talk to them too. But not like every day. Oh and the basil really likes it when you turn on the tv for it. 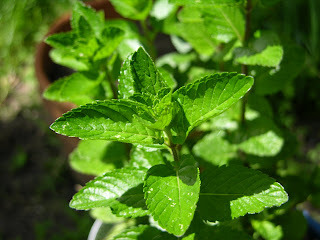 Be careful with mint if you’re planting it in the garden with your other plants; it spreads like a weed. Which is good if you like Mojitos and mint juleps and the like. I have a container full of Peppermint that started out only a few inches tall, and now stands at least a foot high. Planting Tips: Stick with planting it in container and choose a couple of varieties. Mint cross-pollinates, so you might end up with some interesting results. Also, it can be helpful to keep some critters out of the garden. Rodents are not fans of mint; they think it’s stinky, so they’ll usually avoid it. I recommend growing both the curly and flat variety. They seem to be happy co-existing in the same planter together. 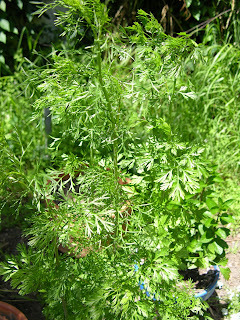 Parsley has many uses, including stocks, soups, veggies, and herbed butter. Planting Tips: To keep your plants productive, cut off the full length of the stems on a regular basis. Cilantro is my favorite herb, hands down. It’s great in salsas, sprinkled on soups, in salad dressing, and of course on tacos and burritos. When the plant bolts and begins to flower the flavor is said to be past its peak. But let the cilantro continue to grow. The seeds from the flowers are coriander, and can be used whole or ground. Planting Tips: This herb has a long taproot, so be careful if you’re transplanting it. I recommend sowing the seeds into an indoor pot filled with high quality potting soil, and not moving them at all. So far I’ve found Sweet basil to be the trickiest herb of the bunch to keep alive and healthy. Starting the plant from seed is relatively foolproof, but once it gets a few inches tall, I am reminded that my gardening knowledge needs some growing. Helpful Hint: A tip from last month’s Organic Gardening said to brew a cup of coffee, let it cool (of course), and use it to spray your basil plants once a week to keep them healthy. I have yet to give this one a try. But wait, there’s more: You can start your herbs indoor in pots, but make sure to keep the soil moist to ensure that they will germinate. Make sure you use potting soil and not dirt from your garden—this will prevent diseases and pests from terrorizing your herbs. Another option is to get a bag of peat pellets at your nursery or hardware store. Later, you can transplant them into a container or to your garden. If you’re planning to move them outside, make sure you “harden” the plants before planting them. Set them outside during the day in indirect sunlight after they’ve grown their first true leaves. Bring them in at night. After a week or so, they should be ready to stand on their own. And don’t forget to water them.